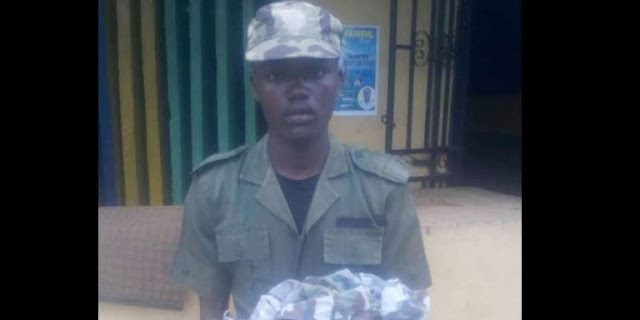 Home > PHOTOS > Police Arrest Suspected Robber Operating In Army Uniform. Police Arrest Suspected Robber Operating In Army Uniform. A suspected member of an armed robbery gang who specialised in operating in army uniform at Mowe area of Ogun State has been arrested, the Ogun State Police Command reveals. The suspect, Adeoye Ayomide, was apprehended around 8pm on Tuesday 25th September 2018, along Ofada Road, Mowe. Abimbola Oyeyemi, the command’s spokesperson revealed that the gang had earlier robbed one Adeyemo Adegboyega, a retired army officer of the sum of N86,000 on September 13, 2018, with a broken bottle. The robbery incident was reported by the victim at the Mowe Divisional Headquarters of the command. According to the spokesperson, the Divisional Police Officer, Francis Ebuhoma, detailed officers to be on the trail of the hoodlums. He said their efforts paid off on Tuesday when the operatives received information that the gang had been sighted in Mowe area. The operatives, he added, then swiftly moved into action, chased the gang and subsequently arrested one of them who dressed in a fake army uniform. Oyeyemi said the house of the suspect was searched and more fake army uniforms were recovered. Meanwhile, the state Commissioner of Police, Ahmed Iliyasu, has ordered the immediate transfer of the suspect to the Federal Special Anti-Robbery Squad, Abeokuta for further investigation.